Prajnanpurush Sri Sri Babathakur, a Self-realized divine soul, has realized the total identity of the Truth Divine with His own Self as also the Self of all, symptomatizing as I-Reality. From early childhood Sri Sri Babathakur was inquisitive about the Divine dispositions and was eager to establish His Identity with the Supreme Self or Self Absolute. He renounced His professional career as an artist, instrumentalist and teacher early in life, and forsook pen, painting brush as well as money and was spending most of His time in deep spiritual trances. A great Divine Soul illumined with the light of Truth emerged and appeared to all as a divine personage— a perfect embodiment of Truth, Consciousness, Bliss, Divine Love and Eternal Peace. When He used to come round from such trances He used to sing and deliberate spontaneously on what He realized in the spiritual pursuit. He used to be absorbed in supreme divine ecstasy totally unconcerned about His physical senses. He wanted others to understand what this realization is. It has been unique. 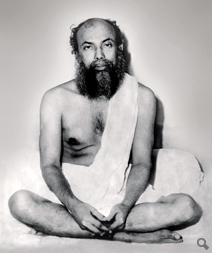 His philosophy does not support pluralistic or even dualistic forms of Sadhana, He even differed from the conventional monistic philosophy and declared that His way of contending a spiritual faith is to repudiate the differences in sects, faiths, religions, caste and creed and in fact, all beings. In His deliberations He mentioned umpteen times that all beings living or nonliving around including His own Self are same and one which verily is Brahman— The Reality and Truth Absolute. In fact His revelations are direct experiences and unfold ‘I-Reality’ which is irrefutable. His vision of life is not limited to common human perception of just a span of years but is perennial in nature. He did not want to be a Guru and initiate others saying, ‘I see Myself in everybody- nobody is greater than and/or lower than ‘I’ and hence He Himself was not initiated either formally in the path of spirituality. But, yet He emphasized the necessity of a real Guru. He said, ‘A true spiritual scientist or Guru can inspire, spiritualize and divinize the whole nature of true seeker by the Self-effulgent light of His spiritual perfection. The spiritual perfection is already there in all of us, only that we have somehow forgotten it. We have become hypnotized by our self-generated lower nature. We have to dehypnotize ourselves. A perfect Master makes us absolutely conscious of it and that He does only by the spontaneous light of His own realization of the ‘Science of Oneness’.